he's a fan favorite...if anything, he's massively overrated by the fans. And last season he was awful, especially during Pogba's injury... 2/10 every games in september and october ffs. But tbf since Ole took over, he's one of our best player but again last season he was awful. Easily our worst player in 17/18. Down to Jose. He mishandled every single player in our team, apart from De Gea, every player underperformed. Herrera for me is not to blame for some poor performances last season, but he still gave his all, oh and not to mention filling Pogba's role isn't easy especially when it's not his position... You're definitely underrating him. Do you think he can fill Pogba's role just like that? Not many people can mate. You don't really understand the role he had to fill do you. He's finally being used correctly by OGS, finally, and look how good he's become. He's vital to our game plan. Absolutely brilliant performance. He was everywhere. Needs a new contract ASAP. He was close to being my MOTM behind Pogba. But what a performance. He is such a clever player. His touch has also gotten a lot more reliable. Hope Pogba and Him remain fit for the remainder of the season, they make our midfield tick. He was absolutely brilliant today. Awesome. Bossed it. He's one of our most important players. Pogba is obviously the MOTM but Herrera is very good lately. Top notch today, an article the other day summed him up the best, "captain without the armband". Up there with Rashford and Pogba since Ole came in. Fkin brilliant, was hoping for him to be subbed off earlier, for him to be somewhat rested for PSG game. He’ll continue to play like this yet we’ll continue to read the bizarre insistence that we ‘improve on him in the Summer’. It’s boring. Honestly, you can scour all over Europe for midfielders but you’re not getting many better than him at what does for this team. Everywhere on the pitch today. Won the ball back just before our first 2 goals. That little scoop he does to flick the ball over the opposing player is godly. I reckon we'd be on 11/11 wins had he started against Burnley. Absolutely class again. Playing in "beast mode" since Ole has arrived. Another very good performance, he breaks up so much play and his use of the ball is often crisp and keeps our tempo up. Really? I see most of us wanting to upgrade Matic but I haven't seen many posters wanting Herrera upgraded. 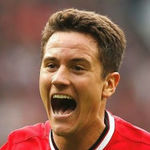 Who needs mad dogs when you have Ander? He does that a fair bit (did it in the last game too). He was outstanding again today, involved in the build up for both goals. Vital to us at the moment. Really? I’ve seen it plenty. We’ve been ‘upgrading Herrera’ for about three years now. We bought Fred and it took about two games to realise he wasn’t anywhere near as good as him. This will be the case with just about every midfielder we get linked to. Exactly what I came here to say. He was superb today. Won almost every tackle. Made some great forward passes. Had a couple of nice shots at goal. I've seen it in the past but not since he's been playing under Ole, at any rate I agree we'll not find another CM that can do the dirty work and use the ball as well as he does in one package right now. Love having a manager that finally fully understands his value. It was absolutely crazy how Herrera won the player of the season in 16/17 for us and was effectively dropped after that. Guy is an automatic pick and Ole finally sees that after LvG and Mourinho for the most part wasted him. He’s basically our Kante. Never lets up, controls the ball well, passes well, gets stuck in, makes himself available and can be trusted with picking the right option under pressure, and seems to be everywhere you need him. For the life of me I can’t fathom how he’s had these long periods where he’s struggled to get games. Glad to see Ole clearly appreciates his utility. Ay, not so much at the moment but I expect we’ll hear it again come the summer. Pogba may be important for our counter-attacking against PSG but Herrera is also very important and the key to our counter tactic if we want to score on the break, he'd recover and intercept balls so he can launch balls on the counter. He must be so infuriating to play against for opposition midfielders. Long may it continue. Absolutely. Heavily missed vs Burnley. He is vital to us at the moment. So tempting to put him as MoM in this match, but Pogba just shades him. Herrera was still fantastic though. He was only poor in the first half of that season. In the second half of the season he was generally good when he played. Probably, I mean we still have some trying to defend Lukaku, some just like going against the grain for the drama. I think one thing is for sure though, we need some depth added to this midfield, we cannot expect Ander to be playing this way without some breaks, the fact we didn't rest any of the midfield in a game against the 2nd bottom team says a lot about the confidence in the back-ups. I’m not having the “Herrera is overrated” by some here. He’s been sensational for us when he’s been allowed a run of matches. No, he’s not Pogba but his contribution is equally important. But he's 29! He turns to dust in a year! He’s always been a mad dog. Under van Gaal and Mourinho to begin with. That strange strange man dropped him for no reason, though. We need him signing a new contract. He is essential our team right now. It's a hang up from a previous mind set some just can't seem to let go of. Herrera hasn't suddenly become a decent player in the last few months, I see his game largely unchanged. Except now we have frequent movement around him, so those short, quick passes many bemoaned as pointless actually add to the fluidity in our play, while the runs in behind and new passing channels in central midfield means Herrera can play those slide rule passes he loves so much on a more regular basis. He isn't winning the ball back with any more frequency either, but now we are pressing with a structure and when he does win the ball back we are captializing on it more frequently. Despite this, there are plenty who would like to insist this 'improvement' has only happened recently, and bringing in another would only improve our play further.